For more than 20 years, RNAO’s Recognition Awards have celebrated the accomplishments of RNs, NPs, nursing students, members of the public and other health professionals. 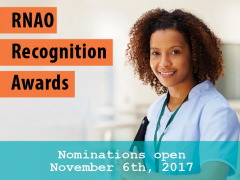 Beginning Nov. 6, 2017, RNAO will be looking for nominations for the 2018 Recognition Awards. Split into five different categories – leadership, education/mentorship, group, student (undergrad) and member of the public – these awards help to foster excellence in the nursing profession and promote the profession to the public. Winners will be recognized at RNAO’s annual general meeting in April 2018. If you have any questions, please contact Patti Hogg at phogg@RNAO.ca or 1-800-268-7199 ext. 220.